The SmartChicago Sustainable Broadband Adoption project is developing innovative approaches to drive broadband adoption in Chicago. The project is funded by BTOP, managed by Local Initiatives Support Corporation/Chicago, and is a part of Chicago Mayor Richard M. Daley’s Digital Excellence Initiative. A major component of this sustainable broadband adoption project is to engage youth, not only as the next generation of broadband subscribers, but also as drivers of broadband adoption for their families. The Digital Youth Summer Jobs (DYSJ), a program made possible by the SmartChicago project, is providing technology-oriented employment and training to 120 underserved youth as well as outreach activities to 120 parents or caregivers. DYSJ is already having an impact on Chicago’s future innovators. 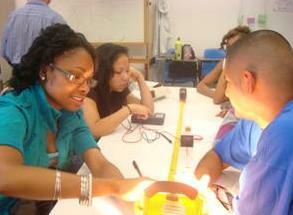 This summer, 60 youth from the Smart Communities program were placed in technology-oriented jobs at over 30 work sites. I connected with Raven, a rising high school senior who worked this summer at Columbia College in Chicago, to understand how the DYSJ program has impacted her engagement with technology and her career goals. Digital Youth Summer Jobs student participants learning about technology and digital media during their summer internship at Columbia College in Chicago. M: Do you think differently about computers and technology after this summer? R: Yes, we have so many advantages available with technology now, and it is constantly advancing. I will also think about computers differently because I've learned that I have to be responsible for all my actions online—for what I express, view, and post. A computer can help you with many things —it is a personal resource that encourages intelligence and excellence— and I’m learning how to take advantage of it. MG: What did you work on this summer? R: In our life skills and job readiness class at Beloved Family Community Services we learned how to be digital citizens. Last week we even used digital media to create a project on the Holocaust and build our own virtual skyscrapers. We are also learning about proper attire and etiquette, and how to dress for an interview. MG: What can you do now online that you couldn’t do before this program? R: Before this program I’d never created a web page – now I can. Now I know about a wide range of computer technologies and programs. With the help of my teachers, I was able to enhance my computer skills and explore a new field of technology. After participating in this program I have achieved and accomplished so much with many new skills and set higher goals for myself. MG: What was your favorite part of the program? R: My favorite part of this program was being able to explore the city of Chicago. We learned about many aspects of Chicago, and we were exposed to different places that I had heard about but never imagined observing. I enjoyed the different workshops and classes that we were placed in that allowed me to create my own web page, engage in photography, and learn about correct professional and casual attire.